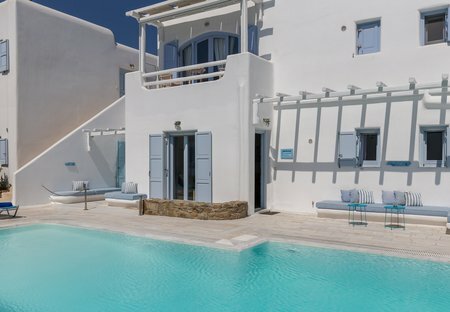 Rent villas and houses in Ornos, Mykonos with private pools. Book affordable holiday rentals that are near a beach. An oasis of calm and elegance, Villa Rho offers the chance to experience both the tranquil and the vibrant sides of Mykonos. Located just outside the charming villa of Ornos. A stone-built exclusive property with a private path to a secluded beach. Amazing panoramic view of the sunset over the Aegean and the islands of Delos and Rhenia.